KIEV, Ukraine -- Ukrainian President Viktor Yanukovych said on Saturday that he was likely to veto a controversial tax reform that has sparked the largest protests in the country since the 2004 Orange Revolution. Protesters have set up tents for a non-stop sit-in on Kiev's Independence Square. "The likelihood of a veto is high," Yanukovych said during a meeting with a group of Kiev protesters composed of small business leaders. "But we can say more about it later, after we all sit down together and review the tax code again," he added. Ukraine's parliament passed the tax reform earlier this month and it is due to come into force on January 1 but still needs to be signed by the president. It has set off the biggest street protests since the 2004 pro-democracy demonstrations and represents a stern test for Yanukovych just as he seemed to be asserting his authority after taking power in February. Small business leaders say the new tax code is weighed heavily against them and in favour of big enterprises that are allegedly close to Yanukovych's ruling Regions Party. The protesters have set up tents for a non-stop sit-in on Kiev's Independence Square that was also the hub of the Orange Revolution. Paying a visit to the tent city with Prime Minister Mykola Azarov, Yanukovych said that no firm decision on the changes had yet been taken. "The tax code only reached my administration yesterday," the Ukrainian president said, vowing to give small business leaders a fair say in any decision. "My experts will be working on it today, tomorrow and the day after until they finish the work," he said. He invited the businessmen to meet with him at his office on Monday, offering to reach a final agreement by Thursday on his return from a scheduled visit to Kazakhstan. 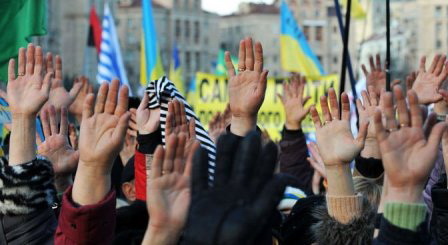 It was not immediately clear if the protesters had accepted Yanukovych's offer. "The president said that he heard us and understood us," one demonstrator said in televised remarks after Yanukovych's visit. "The president assured us today that he is on the businessmen's side." Yanokvych's government seemed open to suggestions of presenting an entirely new tax code to the country after the president vetoes the current draft. But either way, his team seemed set on changing legislation that -- critics charge -- allows small businessmen and the self-employed to get by paying taxes on a largely ad-hoc basis. "One way to go about it is by veto -- and another is to fix it (the tax code) after the veto," Azarov said in comments aired later on Channel 5 television. "We will find the optimum solution either way."